One of the great things about playing spacerock music, as opposed to most other rock genres, is that there are many ways to make audio contributions without the prerequisite of having any musical knowledge. Look at Hawkwind's Dik Mik, who was a TV and radio repairman who used his electronic test equipment to carve out a new sonic niche. Or Brian Eno, who created incredible synthesized sounds with Roxy Music without any knowledge of music theory. Even the simplest punk, country or blues songs require some background in theory (I-IV-V chords, 12-bar patterns) to perform - not so with spacerock! In this column, I'll be writing about some of the ways for the inexperienced to create cool spacerock sounds without shelling out huge sums of cash. Some people might claim that one needs a battery of expensive vintage analog gear (I'll admit to being a bit of a collector of such), but today there are numerous less-expensive, low-maintenance alternatives. There's no reason to have to pay $1000+ for a Minimoog or $2000+ for a VCS3 (unless, of course, you absolutely have to have one, in which case you're a more lost cause than myself). This quarter, we'll start where Keith Henderson left off last issue in his article on the various Dark Star's. The Blacet Research Dark Star Chaos DSC2000 is an analog-digital hybrid synthesizer module based on the Texas Instruments SN76477 sound-generation integrated circuit. The same chip was used to generate all the sounds in TI's late-70's electronic toys, video games and early home computers, and can be viciously noisy to harsh extremes, but is also capable of a wide palette of atonal textures. Although the DSC2000 is intended to be part of a larger modular synthesizer system, it's perfectly functional as a stand-alone noisemaker. Even though the circuit board is exposed, it sits comfortably on a tabletop without much worry of damage - I've carried mine around the country and played it in a dusty barn, so it's safe to say that ordinary, less-rigorous use should pose no problem (and a case capable of holding several of these modules is available from the manufacturer). The front panel, of course (as the only exposed part when "properly" mounted in a modular system), is fabricated of thick, solid, professionally-printed metal and holds 6 knobs, 6 input/output 1/8" (3.5mm) jacks, a "gate" switch to turn the sound on and off, and an LED to indicate the device's on/off status. The output jack provides a pretty high-level signal (far louder than an electric guitar, and even louder than most keyboards), so not a lot of amplification is necessarily required. The only "catch" is the requirement of a 1/8" to 1/4" (or RCA plug, if the device is being played through a home stereo system - if so, be sure to keep the volume down to protect your speakers from the harsh noises) adaptor to run a line from the output of the DSC2000 to an amplifier's input. The heart of any electronic sound generator is the oscillator. The DSC2000's VCO (voltage-controlled oscillator) has its output frequency (pitch) controlled by the VCO knob and input jack. With all the other controls turned all the way down, the VCO knob acts as a pitch control for this simple oscillator - perfect for audio generator frequency sweeps [S1 mp3 sample]. Things start to get not-so-simple when the other 3 sound-shaping knobs (PWM, Noise Filter and Noise Clock) are used interactively. The PWM (pulse-width modulation) knob controls the speed of the timbre shifts (thin sound at narrow pulse-width, fat [or, "phat", if this review was for a techno zine] sound at wide pulse-width), which leads to an additional beating or thumping sounds at the higher VCO pitches [S2 mp3 sample]. The Noise Filter and Noise Clock controls are highly interdependent - turning one with the other at zero yields no audible result. Turning both knobs up a small amount will introduce occasional clicks at random intervals, roughly determined by the Noise Clock [S3 mp3 sample]. As the Noise Clock knob is turned, the clock frequency increases, the clicks occur more frequently, soon decimating the original tone, but later settling into a thin layer of static atop the VCO tone [S4 mp3 sample]. At lower Noise Filter levels, there isn't a whole lot of sonic variation on upper settings of the Noise Clock - because most of the noise signal is being filtered out of existence. But with the filter turned all the way up, the noise spectrum can be set with the clock knob to anything from the rumbling sounds of thunder and tidal waves to the high-pitched sounds of interstellar radio static blown by the solar wind [S5 mp3 sample]. Intermediate Noise Filter settings will result in different responses and "sweet spots" around the Noise Clock dial. At these heavy noise settings, the PWM knob can be used to increase sonic breakup (or to simulate conversations by martian insectoids), even though its' audible effect on the VCO is negligible since the noise is overpowering! The Attack and Decay knobs actually function as "delay" and "hold" controls, with respect to the gate (either from the front panel button, or from the gate jack). Attack determines the delay time after the gate turns on, before the sound starts. By the same token, Decay sets the amount of time that the sound continues after the gate has been turned off. The gate input jack normally accepts a +5V (or higher) input to turn on the DSC2000, but that can be modified by the manufacturer. Mine was configured for S-trigger, where a ground (0 volts) signal turns the device on. This allows it to be turned on/off using a standard footswitch (as long as a 1/4" to 1/8" adaptor is available). 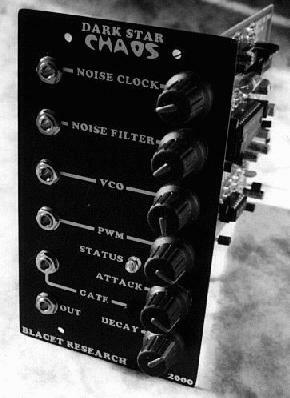 Although the Dark Star Chaos can act as a standalone noisemaker (as it is in all the sound samples on the Aural Innovations web site - no external control or processing equipment was used except for an on/off footswitch), one of its greatest strengths is that it has the capability to be fully integrated into a modular synthesizer system. All four of the sound-shaping parameters can be voltage controlled, on top of their knob settings, by applying electrical signals to the respective jacks. This allows the DSC2000 to output even crazier, more random sounds, as well as allowing it to be "tamed" under the control of external envelope generators, low-frequency oscillators, or other modulators, by synchronizing its performance to that of another synthesizer or keyboard. As an exception to the other sound samples, this one has additional synthesizers running into the four sound-shaping jacks [S6 mp3 sample]. By the same token, the gate input jack can be utilized to turn the DSC2000 on and off under the control of another analog synthesizer, sequencer, or even percussion trigger. At $149 fully-assembled (or as a $129 kit, if you're moderately skilled with a soldering iron), the Dark Star Chaos costs less than many guitar effect pedals. You'll have to add a +/-15V power supply (one that can power several modules is available from the manufacturer for around $25), and then you'll be ready to make some serious noise. There are very few pieces of music equipment that can do so much, especially expanding into atonal and nonmusical realms, for so little. For more information you can visit the Blacet Research web site.